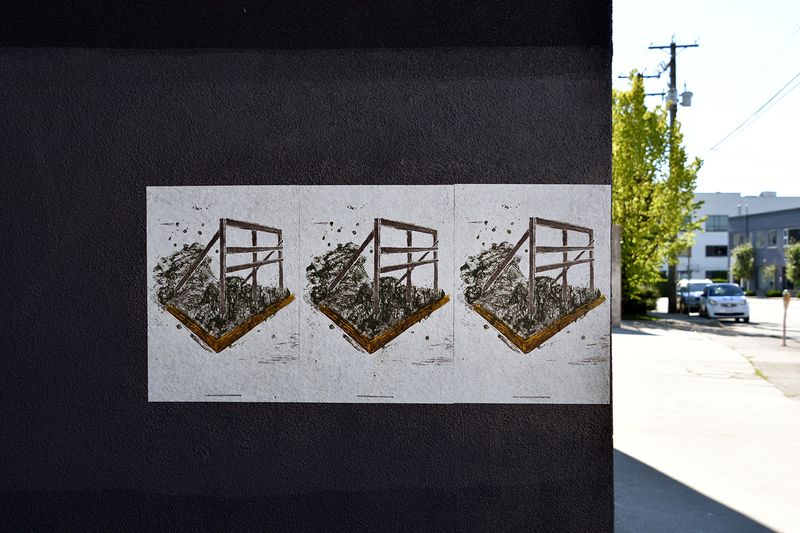 A unique set of poster prints by Vancouver-based artist Diyan Achjadi will be installed on construction site fencing in the Main and Cambie neighbourhoods over the next year. Commissioned by the City of Vancouver’s Public Art Program, Coming Soon! draws inspiration from elements and patterns found on building sites such as dirt piles, tools and traffic cones and represents them through traditional drawing and fine art printing processes. The delicate materials and methods used will contrast to the heavy-duty processes taking place on the sites behind the fencing. The evolving project will also be on display at Welk’s General Store at 3511 Main Street. Achjadi is a Vancouver-based artist and is an Associate Professor of Print Media at Emily Carr University of Art and Design. She received a BFA from the Cooper Union (New York) and an MFA from Concordia University (Montreal). She has exhibited widely at galleries and film festivals across Canada and beyond, most recently at the Richmond Art Gallery, Carleton University Art Gallery (Ottawa), and the Art Gallery of Missisauga. Achjadi has had solo exhibitions at Art Gallery of Greater Victoria, Oboro (Montreal) and AIR Gallery (New York), among others.